Ways of Sunlight, published in 1957, is a collection of short stories written by the Trinidadian novelist Samuel Selvon, and was the Liquorature selection for July 2012, chosen by the West Indian rum pundit himself, largely because I had long been a fan of not only the book itself (having read during my school years), but because I was curious how the crew would handle short story collections in general. And Stephen King seemed too easy, really. Ways of Sunlight is divided into two main parts, one dealing with life in 1940s and 1950s Trinidad, the other with the experiences of the diaspora in London in the 1950s when migration from the Caribbean to the metropole was becoming more common. The main theme of Part 1 is conflict between old and new, parents and children, expats and locals, bosses and workers, and is written in a lyrical style much reminiscent of oral traditions, with frequent use of the vernacular (or creole) in both prose and speech. There is a certain nostalgia in these stories, of a simpler life not as yet cluttered with modern appurtenances and technology, of people living close to the land and having problems more directly related to daily existence. But race and class and disharmonies among economic strata are not ignored. There is humour, poignancy, love and sadness (and the ugliness of human nature as in “A Drink of Water”), clearly described in brief stories. (Note: I found “Johnson and the Cascardura’, the first and longest of the stories, very similar in context and style to Chingiz Aitmatow’s Jamiliya, which also took place in post-war village life). Part II is more concerned with the West Indian migrants residing in London, and explores themes of loneliness, exile, adjustment, assimilation, racism, and friendship. At this stage in our world history, we are so interconnected, so knowledgeable about other places in the world and have built so many enclaves of ethnic and cultural identity in foreign lands (Greeks in Australia, West Indians in New York, South Asians in Toronto or Chinese in San Francisco spring to mind) that it we sometimes forget how much more jarring it must have been in those times when one really was moving from one entire existence to another. But there is a closing nugget of a story “My Girl in the City” where an immigrant speaks of his love for dreary, foggy London in prose that uplifts and inspires and shows the process of assimilation reaching its logical conclusion. I’d prefer not to spoil anyone’s enjoyment of these quickly read, tautly drawn little stories, but I must speak to some of my favourites: “Johnson and the Cascadura,” (which prompted me to ask my father, years and years ago, that since I’d eaten labba and drunk creekwater in Guyana, eaten the cascardura in Trinidad and drunk from that fountain in Bridgetown, to which place would I return to die? ); “The Village Washer”, with the subtly mystical conflict between Ma Procop and Ma Lambie; “Cane is Bitter” about the sad and damaging change to tradition which education engenders, and its oddly appropriate opposite “Wartime Activities.” And then there are the London tales that speak so eloquently, sadly and even humorously about what it means to be an immigrant in a major western city: “Brackley and the Bed,” “Eraser’s Dilemna,” and “Calypso in London.” But really, they’re all good, they’re good humoured, witty, insightful through their brevity as only short fiction can be, and I shouldn’t short change some by preferring others. Sam Selvon was born in 1923 in San Fernando, Trinidad (made famous by the Calypso Rose’s “Ah goin’ to San Fernando” song familiar to any West Indian) and worked for the Trinidad Guardian in the immediate post-war years, during which he began to produce short stories and descriptive pieces under various pen names. He moved to London in the 1950s, and the experience there is what informed much of his later work, which was occupied with the efforts of West Indian immigrants to adjust to life in Britain. It was during the immediate years following his move to Britain that he published A Brighter Sun (set in Trinidad), The Lonely Londoners, and Ways of Sunlight (which bears some similarities to VS Naipual’s Miguel Street). Selvon was among the first of the West Indian writers to deliberately slip into the creole voice in both narrative and dialogue – “the oral strategies of the Caribbean calypso” remarked the Guardian in 1994 – and noted years later that this was what made him able to finish the Lonely Londoners. It’s a little uneven in the short stories of Ways of Sunlight (and Liquorature had a lot of fun provoking me into lapsing into the vernacular, as I have a propensity to do when I have one or five rums too many), but no-one can deny its effect of drawing you subtly into a world almost, but not quite, familiar. 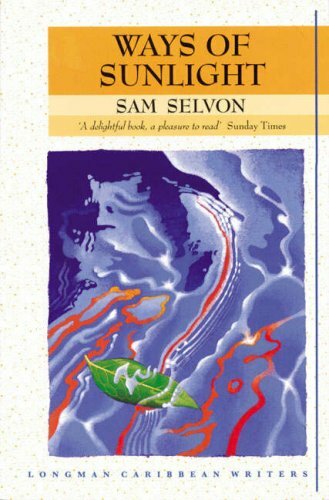 Selvon finished his life as a writer in residence at the University of Calgary in Alberta – a fact unknown to me when I selected the book – and even though his literary output had diminished and received no further acclaim while he was living in Canada (he died in 1994 on a trip to Trinidad), he will always be remembered in the West Indies as one of the founders of its literate tradition. He will live, through Moses, Tiger and Urmilla and Doolarie and the many others of whom he wrote with such poignancy and good hearted humour and wit. We who hail from de Islands will remember his stories the way we do Paul Keenes-Douglas’s comedy or Trevor Rhone’s plays. Speaking for myself, I learnt to appreciate his writing as a student, I learnt to understand him as a young man, and as my years go on perhaps it is right that his characters seem less and less to me like caricatures and more and more like all those people from other lands I met over the decades, seeking like others before them, to make it in new countries of the mind. Review for the July 2012 Liquorature selection, and our first try at short stories. hmmm annalise 3:51 in the morning? A very sweet pastoral Caribbean collection. Why is it that this one post generates so many views? Lots of Selvon fans out there?